The Government will accompany businesses during the path to the target of developing auto industry into the key economic sector and making it remarkably contributing to country's economic growth, said Deputy Prime Minister Trinh Dinh Dung on November 10. Local manufacturing will be able to meet citizens’ demand and head towards exports, said the deputy PM at a meeting he chaired with large auto manufactures in Vietnam. According to Ministry of Industry and Trade’s reports, auto industry has over 400 businesses with most at small and medium sizes. Total assembly capacity is designed to approximate 460,000 automobiles a year. Of these, foreign direct investment companies account for 47 percent and domestic enterprises 53 percent. During the phase of 2001-2014, the industry posted the average growth rate of 17 percent a year, contributed over US$1 billion in taxes to the state budget annually. The industry has provided jobs for 100,000 direct workers. Localization rate in trucks, from and more than 10 seater passenger buses and specialized vehicles has been high with supply of these products basically meeting domestic demand. However Vietnam’s auto industry has just been able to produce some types of simple and low technology components such as driving and rear-view mirrors, lights, seats, electric wire set, accumulators, tires and some plastic items. Few out of the 400 businesses have invested in automotive body shell assembly lines. The target to increase car localization rate to 60 percent by 2010 has been unobtainable. The rate has swung from 7-10 percent on average so far, Toyota alone reaches 37 percent. 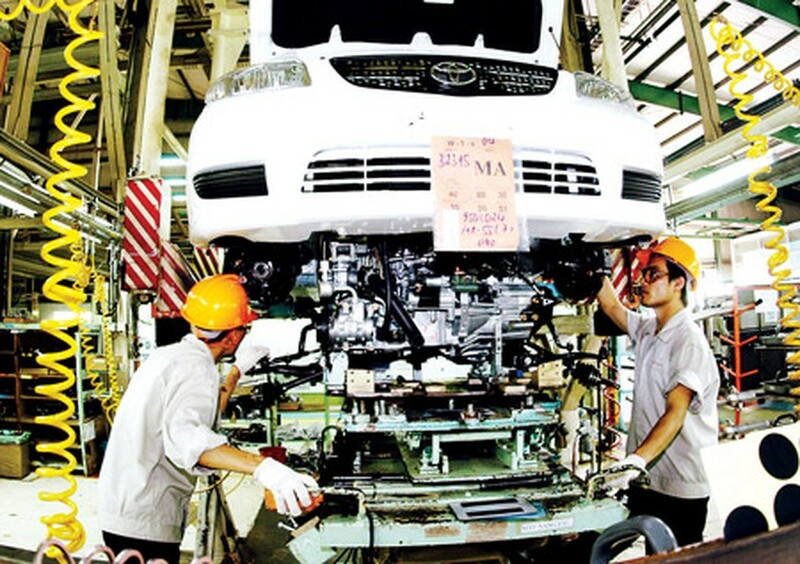 Auto manufactures in Vietnam have yet to create connectivity, specialize auto manufacturing and assembly and establish a system of material suppliers and large-scale component producers. In addition, the industry has been failed to reach the target of reasonable and affordable auto prices for citizens. The price in Vietnam has still been higher than other countries in the region. Truong Hai automaker said that auto import tariff will strongly reduce thanks to free trade agreements in the upcoming years. The company forecast two scenarios. First, auto manufacturing and assembly firms in Vietnam who have owned larger auto making establishments in ASEAN will try to maintain making some lines of products and change into import to some others. Second, there will be a wave of new investment from big automakers without plants in ASEAN. If Vietnam has the right polices, it will have many opportunities to develop the auto industry, according to the company. Concluding the conference, Deputy PM Trinh Dinh Dung said that developing the auto industry into the key economic sector needs consensus between the Government and businesses. The Government will accompany businesses to the target and pay attention to solving their difficulties. He proposed auto manufactures of all sizes to take actions more actively by intensifying connectivity and coordination between local and local businesses as well as between local and international firms. Mr. Dung prompted them to speed up restructuring, determine key products, reduce production costs, improve quality and lower prices. The Government will give priority to developing support industry by speeding up cooperation and market expansion and implementing polices to lure investors to this field. He urged relevant agencies to review, supplement and adjust policies to make them synchronous and better solve difficulties for businesses to develop the auto industry.